The flag of the town of Osakikamijima is white with mark. The town emblem and the flag were adopted on Aug 5th 2003 by Notice No 117. The white flag has a light blue, a green two color town emblem in the center. The town emblem depicts Osakikamijima floating in Seto Inland Sea. It represents an image of the town people who steps forward as three tomes vividly and freely in the abandunt nature since the merger of the former three towns. The flag proportion is 2:3. The height of the emblem is 65/100 of the height of the flag. The flag of former town of Higashino was purple with mark. The town is now, from 2003, part of the town of Osakikamijima. The flag of former town of Kinoe was blue with mark. The town is now, from 2003, part of the town of Osakikamijima. 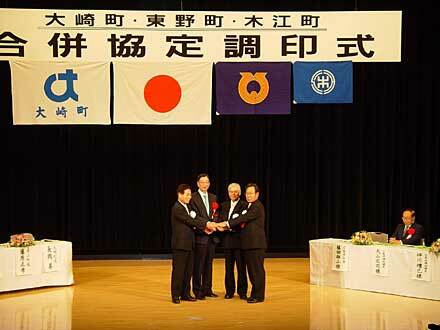 The flag of the former town of Osaki was white with mark. The town is now, from 2003, part of the town of Osakikamijima.